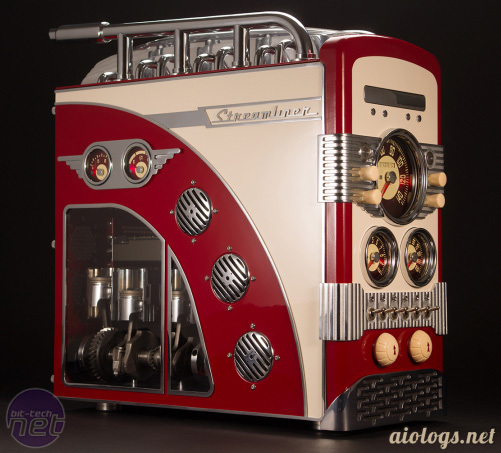 This stunning custom computer case is the work of a builder who calls him/her/itself aio. I happened on it through the 2014 “Mod of the Year” contest at Bit-tech. Now, I don’t necessarily need a computer case with chromed exhaust pipes and a working cam shaft (!) but I do admire the analog gauges, the fit and finish, and the wow factor, not to mention the sheer virtuosity that emanates from this thing. Click through to the project videos to see, part by part, what goes into it. It’s truly wonderful. I have no idea what purpose is served by the cam shaft. You can see in one of the videos that its speed is controlled by the knobs, low on the front panel, and I guess it’s possible that the shaft is somehow connected to the speed of the case fans. Or, equally likely, it’s a bit of sophisticated whimsy. Either way, well done! 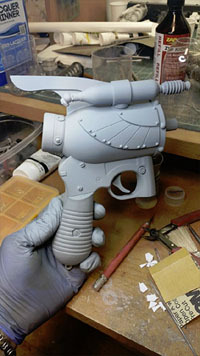 Hey, remember that gorgeous Winged Victory raygun I posted about late last year? 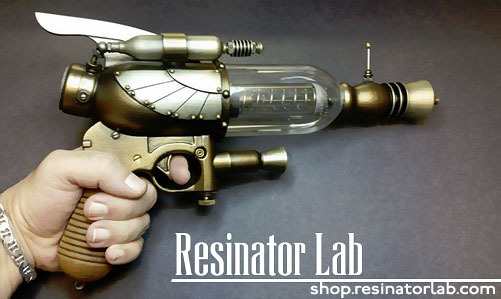 Well, it’s for sale at Resinator Lab. I know you’re all excited and everything, but when you sit down and think for a moment you’ll realize that there’s really just one person who ought to have it. So do the right thing. Some kind of holiday is probably coming up; my mailing address is available. Just saying. But in case you’re not that selfless, you can always pick it up for yourself. I’ll forgive you. Eventually. Added to which, you’ll now have a disintegrator gun… and I’m not completely stupid. Seriously, though, how can this thing not have sold immediately? It’s fantastic. 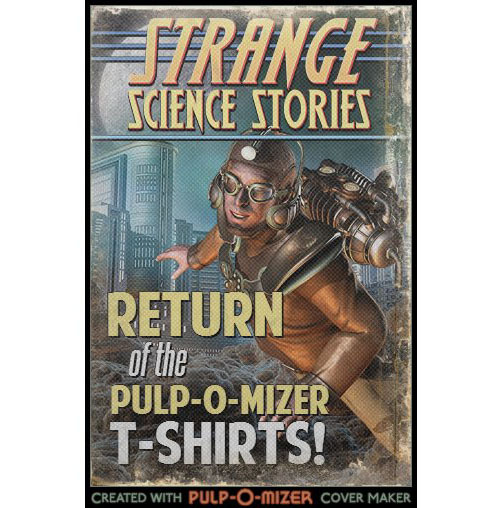 After two solid weeks of hair-raising adventure, the Pulp-O-Mizer is once again cranking out T-Shirts till the cows come home, or at least until you uncover a bug that eluded me. The Tale of Those Two Weeks may never be told: it’s strong stuff, and it features a lot of language that you’d pretend not to know; it came close to breaking my spirit. But it seems to be done. Pulp-O-Mized T-Shirts are now printed and shipped by Spreadshirt. I ran off a test shirt to check their quality, and Spreadshirt does a nice job with them. In addition, the new shirts cost less, which you care about, and I make slightly more from them, which, you know, I care about, and all of this happens with web-like speed and, incidentally, in run-on sentences that will almost certainly make you the T-Shirt wearing envy of all your friends and neighbors. I know what you’re thinking, but these really were a tough couple of weeks. If I’m getting out of this with nothing worse than run-on-sentences I’m going to call it a win. As always, problems can be reported here. Please don’t find any.